Tenacity, determination, and camaraderie are all useful tools in any collaborative endeavor. But our Spring 2017 band used them in great measure, with fantastic results! The members of Some Assembly Required had a lot of obstacles to overcome. The term began with 2 nice-sized bands, then went to 2 small bands, then one large band–all over the course of 3 weeks. In addition, two band members and a mentor suffered injuries (not band related) during the term. When it came time to pick a name, everyone agreed that Some Assembly Required was the perfect choice! Despite these difficulties, the band really stepped up and brought it all together, particularly in the closing weeks of the term. Both of their performances went well, and we have heard that many members are looking forward to signing up for Summer term. In fact, the band was made up entirely of alumni except for one new person, who just happens to be the daughter of another band member. This was undoubtedly a factor in the band’s ability to overcome the challenges they faced. The set was quite eclectic, ranging from John Prine to Sia to some original songs written by a band member. Some folks tried new instruments, and many took on roles in the band that were new to them. I might be biased, but I thought they did a great job. 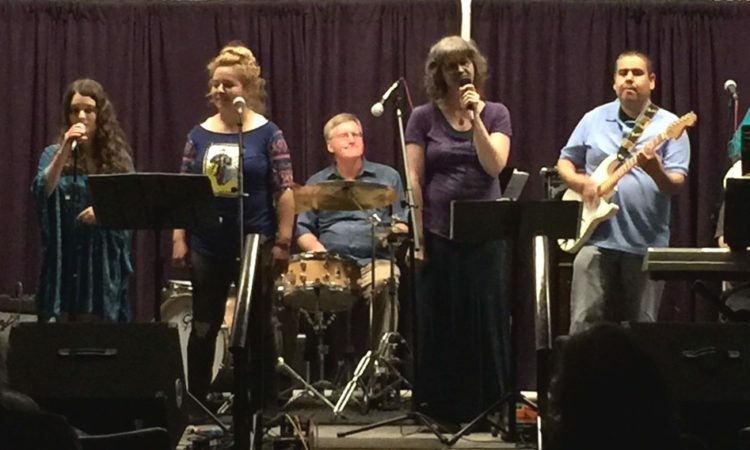 The Thursday prior to their concert, Some Assembly Required also played a short set for the members of Beaverton Masonic Lodge #100, who have supported the Bandmakers program since it began in the spring of 2016. We could not do what we do without their support, and are thrilled to be able to give something back. Summer term begins June 27th, with the next show scheduled for September 9th. We are looking forward to more musicians, more music, and more fun!